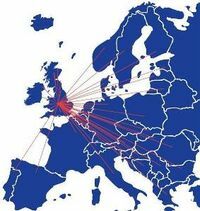 As a member of the Palletline network, we are able to provide a quality nationwide next day and economy palletised delivery service. Being one of the original shareholding members of Palletline, our involvement began in 1996 routing freight nightly through Palletline's Coventry Hub. Since that time we have seen substantial growth both in member numbers and pallets handled throughout the Palletline network along with the relocation of the Central Hub to a state of the art 250,000 sq ft facility near Birmingham International airport. In partnership with Palletline we offer the best and most innovative ways of transporting palletised goods across the U.K. and Europe, driving fast, efficient and reliable services for our customers.